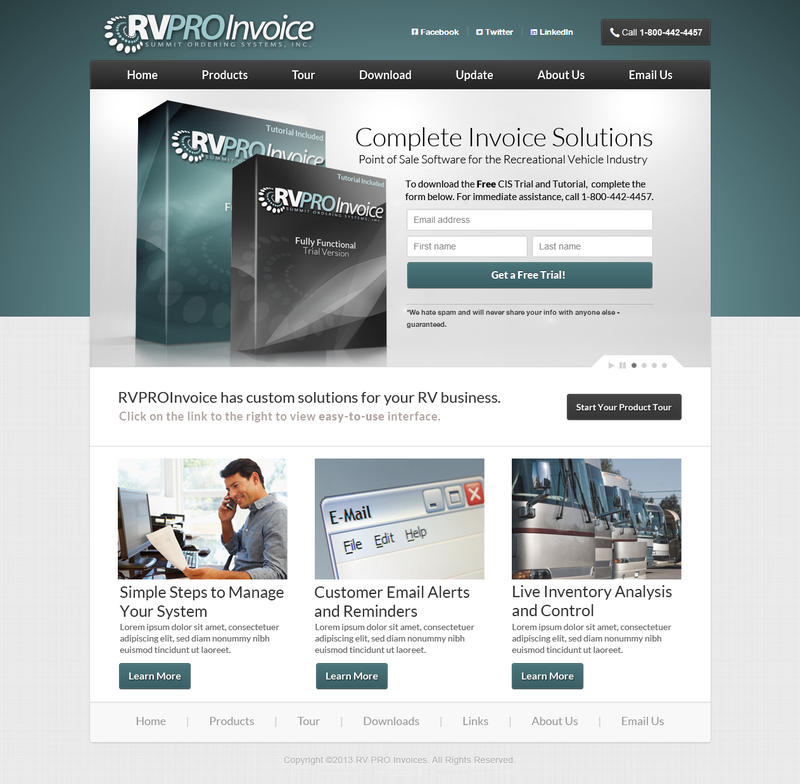 A RV website design for a Point of Sale software called RV Invoice Writer from Summit Ordering Systems, Inc. This software provides solutions to RV dealerships. 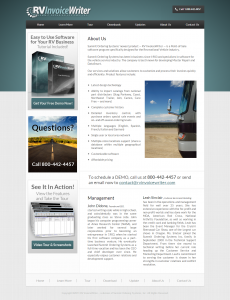 This RV website design provides a professional look with a touch of animation on the home page. The three service areas outline the company’s primary goals and there is also a quick link to the product tour. This site uses global header and footer. These global elements create a fluid feel to the site even in content management areas. The target viewer for this website is RV Dealerships. The use of images from this industry help brand the site. Examples of these images can be found on the inner pages. If you do not have images, stock images can be used. The use of quality stock images can improve your brand. The primary call to action is the free product tour. This page offers an instant download link immediately after the visitor has successfully entered their information on the Downloads page. Some of the information fields that are captured are required in order to use the free trial version of the product. This feature allows you to capture lead information. The free download works as a clear incentive to your viewer. Is your website tired and dated? Check out some of our recent work of Website Design in Baton Rouge and around the country. If you are looking for a RV Website Design or if your customers are RV Dealerships, then just contact us to Start A Website Design today!